*** I had a completely different post lined up for today, but in light of recent events, I felt compelled to talk about this vital topic. I remember like it was yesterday. On April 15th, 2013, I was holding my third baby - who was then two and half months old, and watching the Boston Marathon on TV. When they broadcast the news of the horrific events that hurt and killed runners, it really hit home for me. All I could think about was: "Not the running community. Please, make it stop." Now it has happened again. Three young, beautiful, innocent women whose lives were suddenly taken while doing something they loved. Running is something that each of us love for so many reasons: therapy, exercise, the feeling of freedom as you lace up your shoes and hit the trail or road. It becomes a habit, a joyful feeling and you certainly never think that you may not return home to your family. This has hit the running community hard - can't you feel it? As a female runner, I geninuely felt scared yesterday. I feel scared today. I won't let the fear stop me from doing what I love, but it does give me pause. Am I taking the proper precautions when I am out on the road? 1. Ditch the headphones. Just don't. Have. Them. I know we talk about keeping one bud in your ear and one out, but honestly - that's not enough. Think about it. When a good song comes on and you are really immersed in it, you take away an extra sense you need to be aware of your surroundings. I only listen to music on the treadmill. Period. 2. Let someone know where you are running. There are apps (my husband uses Find my Friend) you can use to track your route, which is even better - because haven't we all changed our mind about which way to run? 3. This is important. Someone should know what your are WEARING when you leave for a run. Think about it - it'll make it easier for police to find you if they know what you are wearing (she had on a red shirt...). 4. 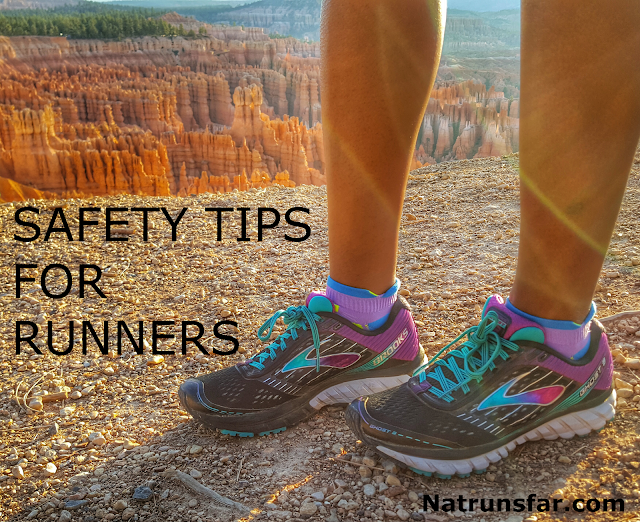 Remember - early mornings can be just as unsafe as evening runs. A lot of times we talk about the danger of running in the evening, but early morning runs can be just as dangerous. It is usually still dark, there aren't a lot of people out and if you run every morning, it can be easy to track your pattern. Don't be a target. 5. Find a group to run with. I know this is hard for a lot of runners due to schedules, etc. I live near a lot of trails and the number one thing that I hear from other runners is DON'T run a trail alone. Another idea is to have a friend or family member bike with you on weekend long runs. My husband will bike with me when I start logging long runs during marathon training. Yes, it can be hard to arrange a baby sitter. Sometimes, he simply brings the kids and drives in the car to meet me at different points. Other times, we ask my Mom or a sitter to be with our kids. Safety comes first. 6. Purchase Road ID AND bring a form of protection. A horn, pepper spray, or THIS new device. I also think a self defense class is an excellent way to learn about protection. For those of us on social media: Be careful what you post. As much as I love blogging about running and engaging with the running community, we all need to be safe. You never know who is tracking or watching you. Don't post where you are running, never run the same routes at the same times and mix it up! Some days, I will drive someplace totally new to run. No one should be able to predict where you will be running. An interesting way to think of it is equating running safety to hiking in bear country. 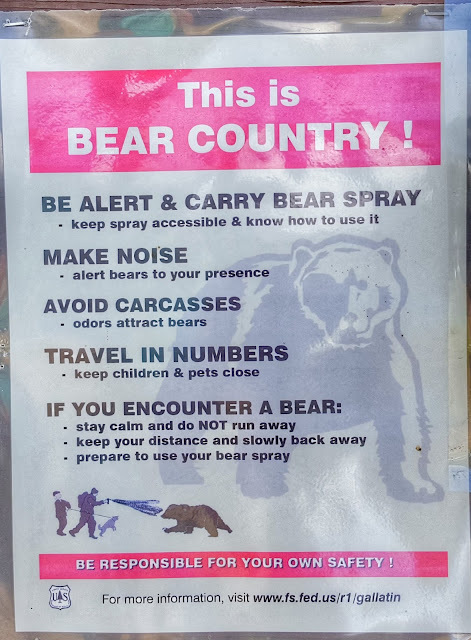 There are signs everywhere telling hikers to run with groups of three or more people, carry bear spray and make a lot of noise. Sounds a lot like what we should be doing as runners. Let's all be safe out there, friends.